It is interesting how Android has evolved in terms of gaming capabilities in recent years. 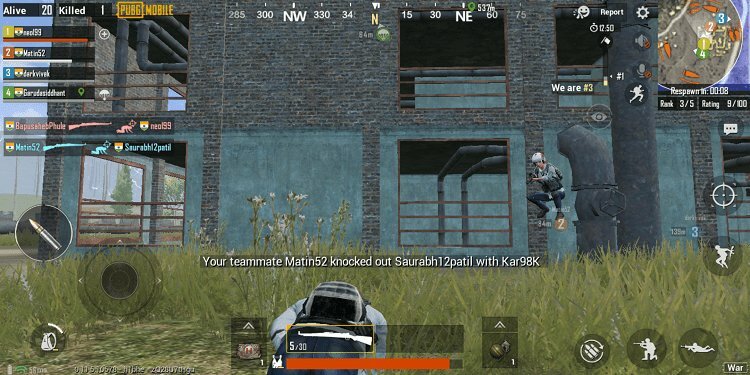 Even budget smartphones like Mi Note 7 Pro is capable of handling intense games like PUBG. 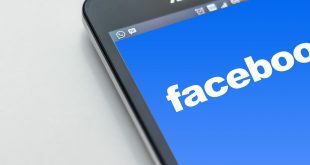 Android game developers have been busy launching shooting games for fans who love going against all odds with their friends and comrades. 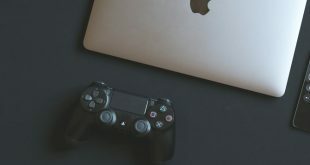 In this post, we will share some of the best single and multiplayer shooting games for Android that you can enjoy in your free time. Well, it is a cliche but I don’t care. PUBG is a runaway success and is currently one of the best first person shooting games on Android platform. I am myself a PUBG fan however unlike some others, I am not addicted to it. The concept is simple. 100 players will land on a deserted island (using parachutes) and will have to kill each other to survive. Each player lands with nothing but sheer will and guts. The player will then have to scavenge and loot weapons, supplies, med kits, and even bags to keep all this stuff including ammos. Raid the houses or kill other players to loot their supplies. The last man, or squad, standing wins the game. The play zone will keep shrinking, forcing players to fight till death. There are no superpowers, but only real-world weapons, and a climax that is full of tension. Each map, there are 4 at the moment, offers different scenery, vehicles, and weapons. It’s a tactical game that closely resembles the way the army and military operates. PUBG is free to play however like all games, there are skins, limited time events, and goodies that you can buy with in-app purchases. PUBG is not the only FPS/TPS battle royale game available on the Android platform. Fortnite has been a massive success and is often compared to PUBG. While the basic storyline remains the same, Fortnite takes a light-hearted approach which is less serious and more fun. With cartoonish characters and graphics in place, Fortnite players can build their own houses to block attacks and protect themselves. Note that Fortnite is not directly available via the Play Store but you can download it from their official site directly using the link below. This was done to retain 30% of revenues that otherwise would go into Google’s pocket. The weapons, vehicles, and graphics are light and more fun compared to PUBG where things are more serious in nature. Fortnite is free to play but like PUBG, offers skins and other goodies to players via in-app purchases. Here is a shooting game with a different, light, and more fun concept. Remember how we used to throw rubber balls at bottles in an attempt to win free snacks from friends? Well, here is your chance to relive those glory days. 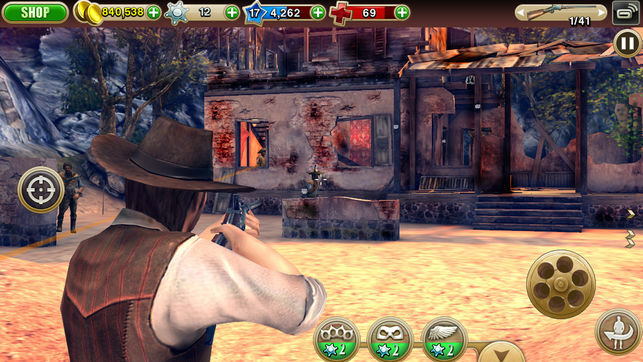 Bottle Shooting Expert will have you shoot bottles in the wild west with snipers. Some bottles are stationary but others are not. It takes patience and timing to shoot down moving bottles. The game has only 30 levels which means it will all be over very soon but is a lot of fun. There is no multiplayer mode yet. The graphics are bright and colorful. The only caveat is the number of ads which often popup but can be easily removed with an in-app purchase. The developer should consider adding more levels to make it worth it. Guns are not the only weapons you can use to shoot things up in a game. Archery King will have you use bows and arrows in a 3D environment and practice moving as well as live target shooting. I didn’t know this but there are different types of bows and arrows and there are components that you can change to improve accuracy and recoil. You can play single or 1-on-1 matches against friends or strangers. The gameplay is very realistic with wind factor and the graphics that are close to home. 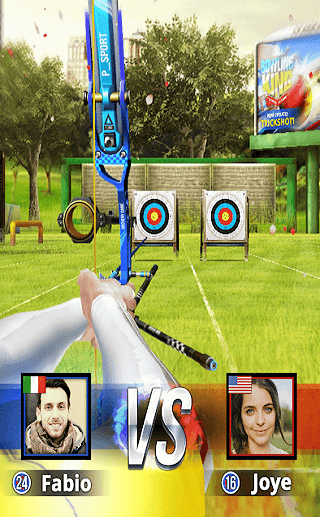 Overall, this archery shooting game for Android brings something new to the table. The game is free to play but comes with plenty of ads that you can remove with an in-app purchase. Everybody loves a zombie epidemic whether its in a movie or in a game, only not in real life! Dead Trigger 2 is dead simple but very popular and addictive game. The graphics are spectacular and beautiful. You can point your gun and start shooting some zombies in no time. There are a few formats to choose from and a storyline that explains the world as it was before the zombie epidemic, missions, and quests. The developer, Mad Finger who are popular for other FPS games, have removed in-app purchases and made everything free recently. There are plenty of weapons like grenades, snipers, and firepower to choose from. Don’t forget to hire your own crew (builder, scientist, and engineers) who will build hideouts for you. Mad Finger also organizes tournaments from time to time where the winners are rewarded with real prizes. 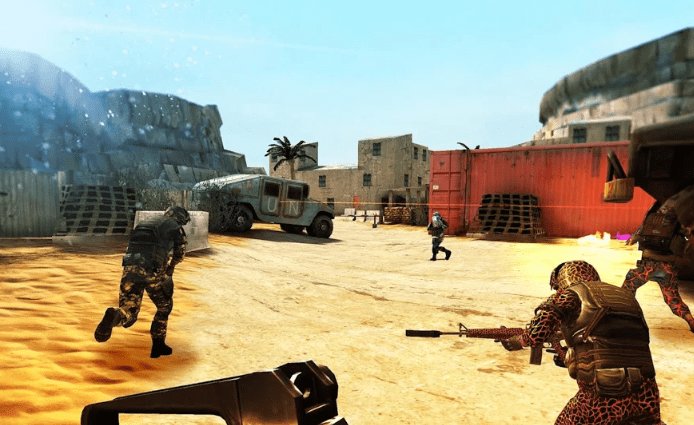 Bullet Force is a multiplayer fast-paced action FPS game. You can play with as many as 20 players at the same time. There are five different modes with a custom one where you can choose who you want to play with. Taking a cue from the popularity of the army centric games, Bullet Force will take you on missions with realistic weapons and sceneries to boot. While the game does needs an active Internet connection, you can also play offline against bots (not friends) which are equally fun to kill. Bullet Force comes with no ads but in-app purchases to buy additional skins and merchandise for your next mission. 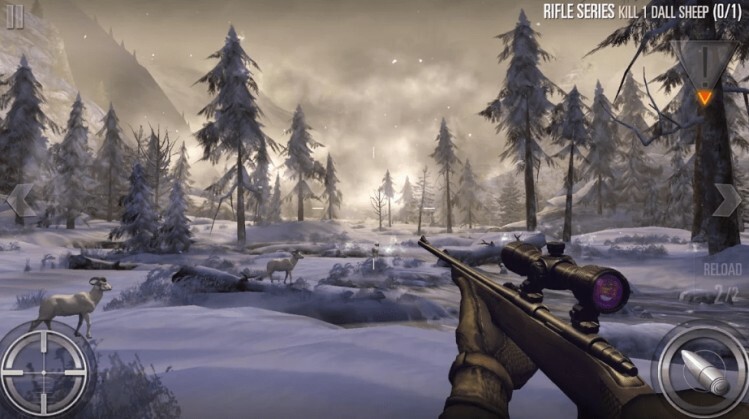 Deer Hunter started as a humble app where fans of wild life hunting were given a way to hunt these majestic animals. Overwhelmed by the sheer response of the gamers, Glu decided to update the app with all sorts of wild animals that you can now hunt. There is enough variety of animals, weapons, and locations to keep your target practice interesting. Deer Hunter was developed by Glu, a popular company that regularly develops amazing action-packed shooting games for Android. It will let you kill deer, sharks, wild bears, and other animals deep inside the forests all over the world. The graphics are good enough and along with guns, you will also be using arrows and spears. The trick here is to kill them before they attack and kill you! For every kill, you will get a trophy and points that you can use to upgrade weapons and outfits. Its open season on Deer Hunter this year. Forget fast cars and the city landscapes. Welcome to the wild west where you will be playing an infamous outlaw who roams the deserts on his horse, looking for opportunities to collect bounties. It’s a scene that will immediately remind you of old Clint Eastwood movies. That guy is a legend. Set in an open world, you will be fighting outlaws, bandits, and thieves who are looking to do you in for some gold and silver. There are 8 different types of horses, guns and ammos, and clothing that you will unlock as you progress through more than 40 missions. The best part is that the game is completely free and feels a lot like the younger brother of Red Dead Redemption which is only available for Play Station. I remember playing Hitman on my friend’s gaming console a long time ago. It was one of the coolest games in the market along with WWF (not WWE). Well, Hitman Sniper is the same action-packed shooting game but for Android. You are a world class assassin (Agent 47) who accepts missions in return for bounty money. This is a tactical game that will require patience, accuracy, and strategies. There are more than 50 missions to complete. You must look out for and eliminate targets without giving up your location and getting caught and yes, you are bald. You will mostly be killing with snipers here because of the nature and storyline of the game, however, there are a variety of accessories to help you do your job better. The game is slow but nostalgic. Also, there is a zombie mode because hey every shooting game for Android has to have one these days. I would recommend you to go slow and try a few of these amazing games one by one, instead of downloading them all at once. The more time you spend in a single game, the more goodies you will unlock and the more you will begin to enjoy the gameplay.